All cetaceans, including whales, dolphins, and porpoises, are descendants of land-living mammals. How did these terrestrial ancestors morph over millions of years into the whales and dolphins we are so familiar with today? Dr. Mark Uhen talks with PBS Nature about marine mammal evolution. What do marine mammals have in common with other mammals? What distinguishes them from other mammals? Modern marine mammals include: Cetacea (whales, dolphins, and porpoises), Sirenia (sea cows and dugongs) and Pinnipedia (seals, sea lions, and walruses). All of these groups share limbs that are modified into flippers, and an overall streamlined body shape. Like all mammals, marine mammals are warm-blooded, give birth to live young, and mothers produce milk to nurse their young. Most cetaceans also have some very sparse hair at some time in their development, but it is very much reduced compared to most other mammals. Unlike most other mammals, modern whales do not have external hind limbs, have their forelimbs modified into flippers, have extra vertebrae in their trunk and back, have flukes on their tails for locomotion, and have their nostrils at or near the top of the head rather than the tip of the snout. Sirenians are similar to whales in that they have only sparse hair on the body. Also like modern whales, modern sirenians lack external hind limbs, have their forelimbs modified into flippers, and have flukes on their tails for locomotion. Pinnipeds are semi-aquatic and all pinnipeds retain hind limbs. In pinnipeds, both the fore and hindlimbs are modified into flippers. Most pinnipeds retain a substantial coat of hair, although not all. All cetaceans, including whales, dolphins, and porpoises, are descendants of land-living mammals. What do we know about their terrestrial ancestors? We know from both studies of DNA and the anatomy of living animals and fossils that whales are part of a mammalian group known as the Artiodactyla. Modern artiodactyls include animals like cows, pigs, sheep, giraffes, camels, and hippos. Artiodactyls have many characteristics that distinguish them from other mammals, but the most distinctive of them are in the foot and ankle. First, artiodactyls reduce the number of toes such that the foot is symmetrical between two digits (a condition called paraxonic). If you think about a cow foot, the hoof seems “split” in two. These animals are often called cloven-hoofed for this reason. The foot actually isn’t split into two at all. Rather, it is actually two toes fused together. Second, artiodactyls have a bone in the ankle called the astragalus (which is found in other mammals as well), but in artiodactyls, it takes on a characteristic form with a pulley shape at each end. Early whales share these characteristics with other artiodactyls. The group of fossil artiodactyls that we think are most closely related to whales is called the Raoellidae, and they lived in Indo-Pakistan, China, and Mongolia during the early and middle Eocene. These animals were probably omnivorous, and some people think they foraged by walking on the bottom of bodies of water. Around what time period did this terrestrial ancestor begin its transition back into water? The earliest whales are known from India and Pakistan from around 52.5 million years ago, during the early Eocene. How long did it take for this land mammal to morph into the whales and dolphins we are familiar with today? What were some of the key adaptations that took place and do we know the order in which these adaptations occurred? Cetacean Evolution. Graphic by Karen Brazell. The earliest whales that we think were fully aquatic, that is, they never left the water, are found around 40 million years ago, during the middle Eocene. That means that the transition from terrestrial animals to fully aquatic animals took about 12 million years. The key adaptations are mostly those that still characterize whales today: forelimbs modified into flippers, extra vertebrae in their trunk and back, and flukes on their tails for locomotion. The earliest fully aquatic whales still had tiny external hind limbs, but they were so small they could not support the body on land. Also, their nostrils were far back on the skull from the tip of the snout, but they weren’t all the way back to the top of the head like in modern whales. How has their evolutionary story driven their behavior, for instance, in developing societies and communication skills? It is very difficult to answer the question of what drives evolution. It is also probably not the right question to ask if you know how evolution by natural selection works. Basically, many offspring are produced, and only a few survive to adulthood and reproduce. Those that are best able to cope with the living conditions in which they find themselves will be most successful in terms of having the most offspring. Thus, evolution by natural selection is constantly changing species as the conditions in which they live change. So, there usually isn’t some driving force behind evolution, there is just the change in species as a response to changing conditions. That said, some whales, particularly the toothed whales and even more particularly the dolphins have evolved very large brains and are also highly social animals. These large brains and the sociality that appears to be associated with them must offer some kind of advantage over those without it. When did whales break into the different suborders: Odontoceti and Mysticeti? What are the primary differences between these two suborders? The earliest known member of the Mysticeti, the modern filter-feeding whales is from the latest Eocene, around 34 million years ago. The earliest known member of the Odontoceti, the modern toothed whales, is from the early Oligocene, around 30 million years ago. This suggests that the split between Mysticeti and Odontoceti occurred during the late Eocene. What is the whale’s closest living terrestrial relative? The closest living relatives of whales are the Family Hippopotamidae, which today includes the hippo, Hippopotamus amphibious and the pygmy hippo Choeropsis liberiensis. The fossil record of Hippopotamidae extends from the early Miocene to today. When did scientists first propose that marine mammals evolved from land-living mammals? What findings led to this conclusion? Ever since classical times, people knew that marine mammals were different from other sea creatures and they recognized some similarities with terrestrial mammals. Once scientists began to formally classify animals in the 17th century, whales, sirenians, and pinnipeds have all been recognized as mammals, but the placement of some of these groups (particularly whales) within mammals has been controversial until recently. Were the cetaceans the only land-living mammals to return to water environments? If there were others, did they return to water during the same period and did they morph in similar ways? There are only two groups of mammals (that we know of) that have become completely aquatic. These are the Cetacea (whales, dolphins, and porpoises) and the Sirenia (sea cows and dugongs). These two groups both originated in the early Eocene, and have followed rather similar evolutionary pathways, particularly in how their limbs and modes of locomotion evolved. This is despite of the fact that cetaceans are carnivorous and sirenians are herbivorous. In addition, the Pinnipedia (seals, sea lions, and walruses) evolved from a group of dog-like Carnivora in the late Oligocene. Pinnipeds are all semi-aquatic, coming ashore to breed and have their young. Another group called the Desmostylia evolved in the early Oligocene and lived until the late Miocene in the North Pacific Ocean. Desmostylians are thought to have been semi-aquatic herbivores. Why did marine mammals go back to the sea? It is difficult to answer the question “Why did marine mammals go back to the sea?” Remember that evolution by natural selection facilitates tiny changes generation by generation allowing those that function better in that particular environment to reproduce more often. That said, the earliest changes that we see in whales and some other groups of marine mammals involve feeding and sensory perception. It looks like these early terrestrial ancestors of these groups began feeding in the water and became more adapted to aquatic conditions over time. 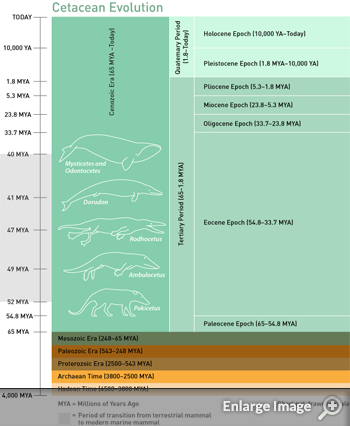 What research is happening currently on marine mammal evolution? New discoveries are continually being made by geologists, paleontologists, and modern biologists about the evolution of marine mammals. Geologists are constantly revising the age estimates of rocks in which we find fossils. New fossils are being described from Indo-Pakistan, North Africa, North And South America, Oceania, and Europe. 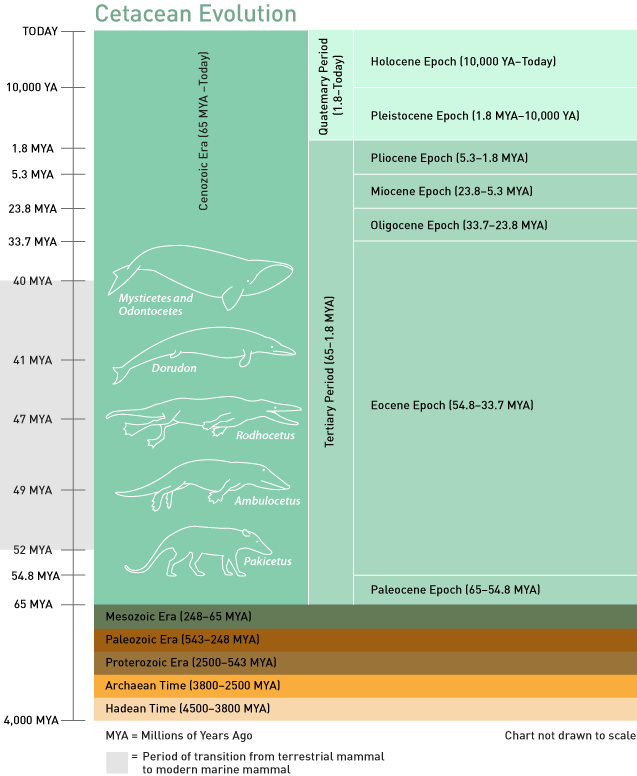 This is an exciting time to study marine mammal evolution as many of the most important discoveries in this field have been made in the last 10-15 years, and there is no reason to expect that pace of discovery to slow down in the near future. Mark Uhen is an Assistant Professor of Geology at George Mason University. Previous to working at Mason, Dr. Uhen was Curator of Paleontology at the Alabama Museum of Natural History, and Head of Research and Collections at Cranbrook Institute of Science. Dr. Uhen is also a Research Associate at the United States National Museum of Natural History. His research focuses on the origin and evolution of cetaceans (whales and dolphins), major evolutionary transitions in general, functional morphology, use of stratigraphic data in phylogenetic analysis, and theoretical aspects of diversification. He has published many papers in scientific journals, contributed chapters to edited books, and presented at numerous scientific conferences.